The Gondar College of Medical Sciences is located in Gondar in the northwestern part of Ethiopia. The college, founded in 1954, is the oldest health professional training institute in Ethiopia. The medical college was located in Gondar in 1954 in part because of the malaria epidemic that devastated the region during 1952 and 1953. The college was designed to educate various health care workers in a manner that would allow them to address the particular health needs of rural Ethiopia. While most professional training institutions focus on preparing graduates to understand the disease processes as they affect individuals and especially on diagnosis and management, Gondar College has emphasized preventative medicine and focused on public health (community health) in its training, service, and research activities. In 1961 the college was placed under the direction of the Haile Selassie I University, now known as Addis Ababa University. The college also offered for the first time a bachelor of science degree in Public Health. Over the next 20 years, the college played a prominent role in preparing over 1,100 professionals. In 1978 the institution was authorized to establish a medical school to train doctors, health officers, community nurses, and other health professionals. Since 1979 when the first class enrolled in the school’s medical program, the program has grown both in size and function. 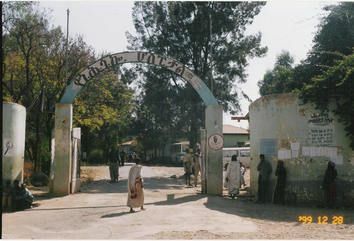 In 1994, the college was renamed the Gondar College of Medical Sciences (GCMS), and its mission was redefined to include the basic research in health sciences and to serve as a referral health center for the region. The college is at present undertaking various projects for expansion of its activities including construction of a new library, a student dormitory, classrooms, and science laboratories. It increased its student enrollment by 30% with the 2009 school year. Today GCMS has over 2,000 students enrolled in medical and health science fields ranging from nursing and public health to internal medicine, surgery, pediatrics, obstetrics/gynecology, radiology, dentistry, and orthopedics. The students are recruited from all regions of Ethiopia. In 2004 GCMS became part of the University of Gondar. The entire university has 11,000 regular students and 6,000 extension students in 35 undergraduate programs and 8 graduate programs. Solomon Addis Getahun, "The Evolution of Gondar's Public Health College and Training Center: Che-Che-la from an Italian Consular Office to a Medical College," Northeast African Studies 8: 1 (2001); "Social Research," Gondar Development and Cooperation Organization Newspaper (2008); University of Gondar Website, http://www.uog.edu.et/. (2008); University of Gondar Website, http://www.uog.edu.et/.